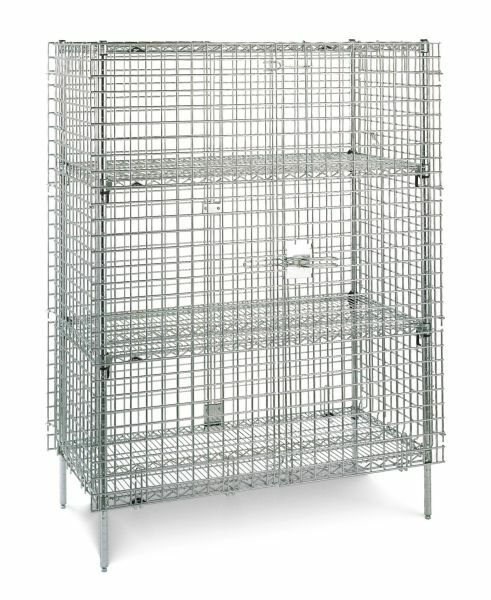 Eagle Group Stationary Security Cage with open wire construction and patented Quad-Truss® design shelves. Full-access double door with quick-action locking feature with hasps for padlock. Design and Construction Features: Eagle Group Security units are ideal for safely storing and transporting costly materials and items subject to pilferage. Patented QuadTruss® design makes helves up to 25% stronger. Heavy-gauge open-wire construction keeps contents visible for quick inventory checks. All units are plated with a durable easy-to-clean finish. Quick-action locking feature with hasps for padlock. All Eagle Group security units feature full-access double door swinging out at approximately 270°. 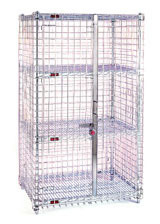 Nexel Stationary Security Cage for a safer and more secure way to store valuable equipment and inventory. Open 2" square grid mesh ensures high visibility, while lockable double door (opens a full 270°) keeps contents protected. Security units feature adjustable levelers and assemble easily. Available in Chrome and Poly-Z-Brite. All units are 66" high with top and bottom shelf. Shown with optional intermediate shelf. 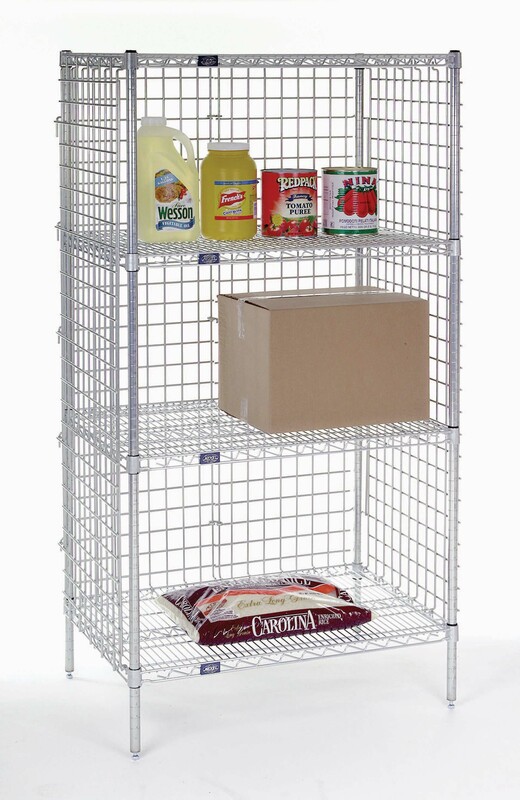 Metro Stationary Security Cage: Protects valuable materials and sensitive items from loss or pilferage. Ready View of Contents: Heavy-gauge open wire construction keeps the entire contents of the truck visible at all times, making it easy to check inventory. Metro Adjustable, Optional Intermediate Shelves allow flexibility to meet changing needs. Can be positioned in 1" increments along the entire height of post. Metro Patented, Ergonomic, 1/4-Turn Door Handle: Makes opening and closing the unit easier than conventional security unit designs. Metro Double Door: Each door opens 270 degrees and can be secured along the sides of the unit. Time Saving Assembly: Metro security units assemble quickly — right out of the box. Metro Stationary Units: Posts have leveling feet to compensate for uneven surfaces. Not sure of the type of finish you need? Eagle Group EAGLEgard Hybrid Epoxy Wire Stationary Security Cage. NSF-listed for all environments. Zinc chloride plating followed by clear chromate plating with MasterSeal® Sealer and a hybrid epoxy final coat. Eagle Group Chrome finish, NSF-listed for dry storage environments, Bright nickel plating followed by chrome plating. Nexel POLY-Z-BRITE features a true powder-epoxy over zinc-chromate electro-plating that ensures a strong durable finish that resembles the look of chrome, yet handles temperature and moisture extremes even better. Nexel CHROME is electro-plated nickel-chrome resulting in a brilliant high gloss finish. It is a quality finish that is both hard and durable with a high tech look at an economical price. This industry standard has proven to be a favorite and perfect for display and dry storage. A Brilliant Finish for the High-Tech Look. Metro Chrome is heavy duty nickel chrome finish for dry, low humidity environments. Metro durable chrome finish includes a protective lacquer coat. Metro Metroseal-3 is corrosion resistant finish for wet or high humidity environments with a 12 year warranty against rust and corrosion. Metro Polished Stainless Steel addresses the most aggressive applications and environments. T ype 304 stainless steel.